Exclusive: Reliance Jio showcases its Internet plans on a preview portal, plans starting at Re 1 ? We have been hearing since long that Reliance Jio will offer Internet at ultra-affordable prices but nothing concrete has come out so far, but the wait is over. Reliance Jio has showcased its Internet plans on their preview portal. The preview website claims that Reliance Jio will be offering high-speed 100Mbps internet connection with recharge plans as low as Re. 1. The ‘FTTH FIP Alpha Offer’ plan is claimed to offer Fibre to the Home (FTTH) connection with a speed of 100Mbps with a usage quota of 100GB and free On-Net usage discount. This plan will offer validity of one month and the package box will include the Router Gateway, Router Drop Cable, Wi-Fi, and Ethernet. 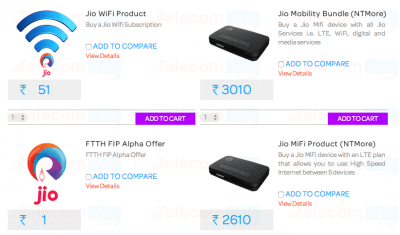 The ‘FTTH FIP Alpha Offer along with Wi-Fi and JioDrive’ plan is claimed to offer Fibre to the Home (FTTH) connection with a speed of 100Mbps with a usage quota of 100GB and free On-Net usage discount. This plan will offer validity of one month and 100GB of cloud storage for one year. It might also come with a Wi-Fi Hotspot device, which will offer high-speed Internet connectivity in various cities. The ‘Volte Basic’ will First Recharge (FRC) will offer unlimited voice along with Rs. 1,099 plan which will offer Sports Channel pack of 50 Channels. The details are from Reliance Jio’s preview portal so we are not sure if the plans are final, as they can change it any time. We will keep you updated as and when we get the information. Thoughtful post ! I am thankful for the points – Does anyone know where I might be able to grab a blank NE Form 521 example to fill out ?